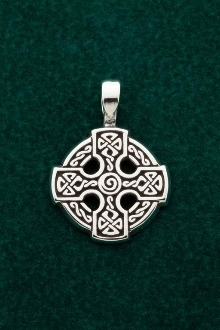 The wheeled cross is an expression of the cross image a result of several levels of belief throughout Celtic history. There are many examples of crosses in the manuscripts of Celtic Christianity with this type of "Equal Arm Cross" layout. The crosses of this nature are directly related to Christianity, there is also an undertone of connection to ancient Celtic belief systems the concept of the cycles of the year through the solar wheel. All things in this cylic concept are cirular in nature due to the endless circle of life, death, and rebirth.